I can’t get this picture out of my head. I’ve been thinking about it for nearly a year now and it keeps tearing at my heart. For those who are unfamiliar with it, it’s called “Meine Frau in Freud und Leid” (My Wife in Joy and Sorrow) and it was taken in 1911 by August Sander. 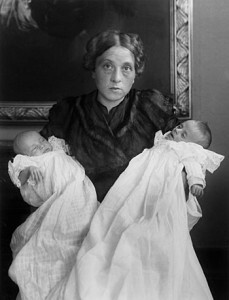 It shows Anna Sander holding their children, Sigrid and Helmut. But, as you might imagine, only one of the children, Sigrid, is alive. Her brother, Helmut, died shortly after birth. I’ve looked at the picture and tried to decide which child was Sigrid and which was Helmut. I’m still not certain, but I believe that Helmut is on the left. The only reason I think that is because the baby’s hand is limp. But really, it is very difficult to tell. I look at poor Anna and think about her pain and the pain of August. They both knew when they took this picture that it would be the last picture they would ever have of Helmut. Anna sits there, almost without emotion, just staring into the camera. I wonder what was going through her mind and what was going through August’s mind at the time. Surely, the title says it all: “Freud und Leid.” Life is joy and life is sorrow. Could any picture ever capture this better? This entry was posted in Great Photographers, On Photography and tagged August Sander, Death, Infants, Life. Bookmark the permalink.